Hello ALL…. The little press is coming along nicely. This last week, I finished the roller, built the eccentric trucks, made the carriage, and did some test assembly. The action is nice and smooth, with no noticable side-play…. and the roller height stays perfectly at rail height (galley high) plus or minus .001”. (That’s 1/1,000th of an inch for us fractional folks. ) It is as close to perfect as my lathe, and my limited skills/ eyesight will produce. The toughest parts to build were the eccentric trucks. Getting them just right took a LOT of pondering. I know I could have just bought similar parts from McMaster Carr or Grainger… but I just didn’t like the idea of using Chinese made parts. Besides, the store-bought eccentrics didn’t have the right amount of adjustment, and they cost $25 each… so I made my own. Below is how it looked as of yesterday. As you can see, I still need to build the base, and the grippers. Those are on the schedule for this week, depending upon my workload. While the little press was designed strictly for functionality, I did add one little touch just to make it a little less industrial looking: the mahogany trim pieces on the side plates. They aren’t actually required, but I added them as an homage to my earlier wooden presses. I may go one step further and add a little carving just below the main axle bearing. What do you think? With any luck, she’ll be ready to print with by the end of the week. I’ll keep you posted. That thing looks great! I’m sure it’s going to do some good looking prints. Very, VERY nice! Congratulations! I’m interested to see how you make the grippers. 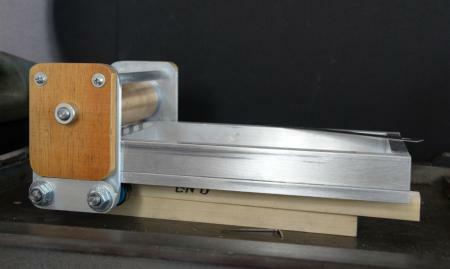 I made a small proof-style press last year to make my portable press set up airplane friendly. I thankfully had the help of my uncle (who is a machinist) and had a pinch-style sheet metal gripper made styled after my Linoscribe 711. I’ll take some detailed photographs and post them when I am back at my studio later, but here is an overall shot. galen… that’s an interesting design. I’ve never seen linear bearings used in a press before. I would like to see the gripper design better. Billy & Geoffrey- thanks. What do you think about the idea of a little carving on the side plates for decoration? Carving would be good. Plus you might rout a border around the wood. Also, somewhere on the press, you could stamp the year of manufacture and serial number. In 100 years, people might wonder about that. Or you could write some descriptive info on a sheet and glue it to the bottom of the press. It is always nice to find info like that on a machine. (Off topic: I also do that when I’m making renovations to my house). 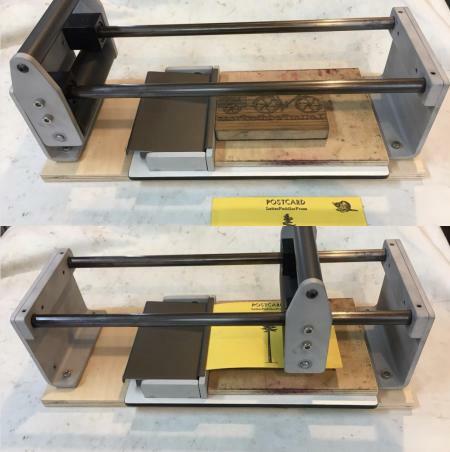 Galen, I love seeing that more of us are making the effort to create home-built presses that are sturdy and usable. Nice going using linear bearings; your design will deliver reliable performance, ease of use and long life. Winking Cat, I would decorate the wood sides and maybe even give the press a name. I also calculated the cost to produce. If I were to pay myself a decent wage for the actual work and use all new marterials (no recycled metals), it would be quite easy to produce and sell them in the $500 to $600 price range and make a good profit. However, judging from the number of folks who responded to the various discussions: 7 total individuals (all great folks, by the way. ) it does not appear that there is enough interest to justify producing them for sale. That’s ok though. The primary goal was to produce a small, easily portable press that will put down a good image with wood-blocks, metal type, or PP plates…. and this machine will certainly do that. 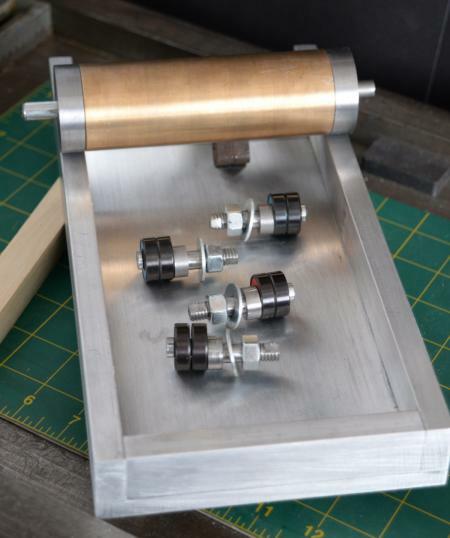 My next phase is to build a nice box for the press…. with a place for all of the stuff one would need to print. It’ll be a “print shop in a box” sort of thing. I’ll post the final pics in a few days. That looks like a very interesting press. i don’t think there is any way to gauge interest based on responses to your post. You would need to post an offer to sell, or even a crowdfunding post, to gauge potential interest. Potential buyers are not necessarily reading this forum. Also it is not clear to me what is the impression area size of this press, and whether it is adjustable for different paper thicknesses. We have demonstrated a Line-o-Scribe press that can print an area about 11x14” at various wayzgeese events, and have had lots of unprompted interest in buying such a press. I am sure it would be more expensive to make a larger press, but if it could be sold for $1000 or even $1500 there could be lots of interest. I have no idea of the relative costs of different potential press sizes, just throwing that out as an example of what would be useful to print with wood type, a common usage for such presses now. Hello Matt…. the impression size was discussed in earlier progress posts on Briar Press. It’s 5x8, with a max paper size of 5x9.5. Like many sign-press style machines (Showcard Model A, Nolan, Vandercook Model O and etc) , the impression roller is fixed relative to the rails…. but the impression is adjustable for various paper thicknesses by shimming (or removing some shims) under type/block and/or using a packing sheet between the paper and the impression roller. To facilitate this, the rails are a little higher than type high. It’s simple, works perfectly, and has no additional parts to wear. About interest in the press: I’ve actually had great success showing the little press to people in the community. People who see it tend to like it. I’ve had several inquiries about buying one, kits, or plans. However, the real goal of the project was to build a small press for my own uses, and to demostrate the concepts of printing / printmaking to others… and the little press will do that perfectly. The idea of producing and selling copies was just an afterthought. Winking Cat - Thanks for the info. I would be interested in getting a set of plans if you decide to go that direction. Makes sense to use shimming for adjustments, that’s what we do with some of our old proof presses at the museum print shop in San Jose. A couple of the presses have cylinders large enough for tympans and packing, but it is a lot quicker to make a small adjustment for a different paper with shims added or taken away under the form.